This is indeed bad advice to follow, as using butter or other oily substances on a burn will actually delay the release of heat from the affected skin area. This can in turn affect the healing process by retaining the heat in the skin. Cold water is by far the best treatment after a burn, and loosely dressing the area with dry sterile dressing pads. As other substances or foods administered can worsen a poison ingestion problem, it’s best to consult your local Poison Control Center or a medical professional for accurate advice. In this instance, the reverse is actually true- applying cold compresses or ice wrapped in a thin towel for 20 minute periods, (known as “icing”) will reduce swelling to the area, as well as anti-inflammatory drugs if they’ve been prescribed by a physician. Tourniquets can actually inhibit or stop the blood flow, which can in turn cause permanent limb damage if used improperly. Tourniquets should only be used as a last resort in response to severe bleeding. A better approach is to pad the wound with sterilized gauze or cloth, continuously applying pressure and wrapping tightly. As spinal cord injuries are impossible to detect from appearance alone, any movement could lead to paralysis or even death to someone who’s been involved in an accident. It’s best to instead try to stabilize the victim and keep them still until paramedics or help arrives. Only in extreme circumstances including possibly that the surface the victim is on is not flat and you need to perform CPR, should moving the victim be attempted. As alcohol can be absorbed via the skin, this can trigger a possibility of alcohol poisoning, particularly in young children. A more effective and safe way to lower fever is taking ibuprofen. Anaphylactic shock, or the condition of anaphylaxis cause a person’s immune system to release chemicals in large amounts that can cause a person to go into shock. By attempting to treat a bee sting at home to someone who is potentially allergic to bee stings can prove fatal if left untreated by professionals or with an EpiPen promptly. Symptoms of shock include a skin rash, rapid pulse and tightening of throat, swollen tongue or labored breathing- an ambulance should be called immediately without delay. By rubbing the eyes, it’s possible to scratch the eye or embed the object or substance further, potentially causing damage. Always use cold tap water or seek professional help to treat eyes. An extreme change in temperature can actually cause further damage to frozen skin/extremities. Instead work to gradually warm the area with lukewarm water as first aid treatment. In actuality, exposing the wound to fresh air is the most effective way to allow for healing; whereas ointments keep the wound moist. Treat it first with soap and cool water, and if it’s deemed a bandage is required, it should be changed twice daily, and removed for bed time where possible to allow for air to circulate. 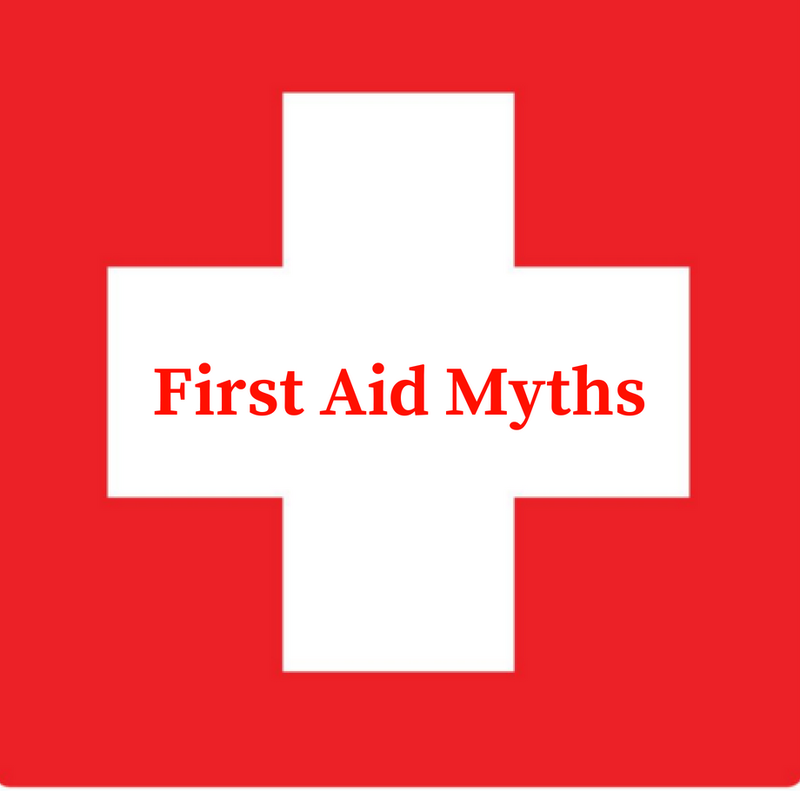 Being prepared is the most effective way to offer proper First Aid treatment. Enroll in your local First Aid certification course to be on top of all the latest techniques and training. When it comes to performing first aid, it’s always best to consult, where possible, with a medical professional.